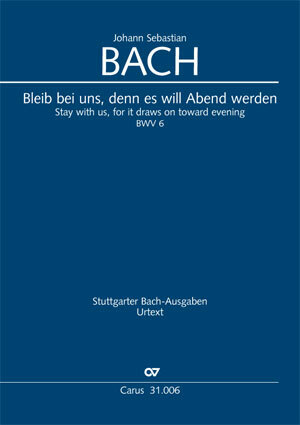 Bach composed the cantata Stay with us, for it draws on toward evening BWV 6 for Easter Monday 1725. In fact, it is certain that a chorale cantata had been planned for that feast day, but for some unknown reason, the annual cycle of chorale cantatas broke off just before Easter 1725. For BWV 6, Bach fell back on a text by an author whose texts he had already set numerous times in his first Leipzig annual cycle of cantatas (which are conspicuous by their ever constant structure and use of two chorale settings). From the gospel for Easter Monday, the story of the Emmaus disciples, only the disappearing daylight and the fear of being left alone are made the subject of discussion. A truly magnificent choral movement opens the cantata. The first chorale for soprano and violoncello piccolo, which Bach later included in his "Schübler-Choräle," is also well-known outside of the cantata.